Want to share your Flickr photostream with the world, but only once you’ve given it a nice, customized touch? Look no further than CakePHP — and a few lines of code — to pull off some magic! In this article, we’ll use the Flickr API and CakePHP to take the images we’ve loaded onto Flickr and use them to build our own, non-Flickr web gallery. CakePHP, a PHP framework for rapid application development. The current version as of this writing is 1.1.13.
phpFlickr, a PHP class that facilitates interaction with the Flickr API. Flickr Component, a CakePHP component developed by Miguel Ros (rossoft) that ties the phpFlickr class into the controller and view of our application. If you’re not familiar with CakePHP, check out the SitePoint article, The CakePHP Framework: Your First Bite. You’ll want to have a decent understanding of how the framework works before diving into this example. If you don’t already have an API key, you’ll need to apply for one. The $name attribute is required if you’re using PHP4, but can be omitted if you’re using PHP5. 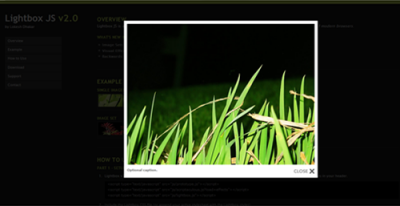 The components array will automatically load our Flickr component. Finally, we set $uses to null to prevent the controller from auto-loading a model. This routes all URLs that start with /gallery/ to run the index method of our gallery controller. The first thing we see here is that the index function is expecting an $id. This is a photoset ID that we can pass in to pull out a specific photoset. Remember to replace USER_ID with your user ID, which you retrieved from the Flickr site. Just like that, we’re almost done. The last thing on our plate is to figure out how to lay this gallery out. You’ll need to create a new folder in /app/views/ called gallery, if you haven’t already. And in that folder, you’ll need to create an index.thtml file. 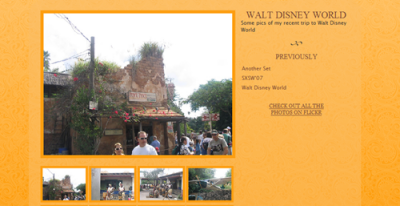 Clicking on any of the links will load that particular photoset. 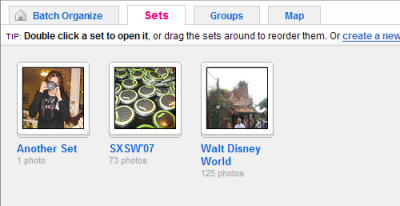 If you’d like to change the order in which the photosets appear in the list, you’ll need to go into Flickr and use the Organize feature. This code grabs the links on the thumbnails and attaches onclick handlers to each one. When the user clicks on a thumbnail, the new image will load in place of the large image on my gallery page, instead of sending the user to the Flickr site. <li><a href="<?php echo $flickr->buildPhotoURL($item, 'medium')?>"
$flickr->buildPhotoURL($item, 'thumbnail')?>" alt="<?php echo $item['title']?>"
Lightbox uses the title attribute of the link to display a description when the larger image is viewed. And the rel attribute is required to tell Lightbox to include this image in the set. That’s it — you’ve now got a Lightbox-enabled photo gallery!